An Orange POMANDER: The perfect gift for anyone to give to almost anyone. UPDATE: One of Santa’s elves came through with the typed (instead of Nancy’s with my chicken scratches on it) version of the Gumdrop Muffin recipe. Here is the Gumdrop Muffin recipe! Also, are you looking for the perfect gift for a child to give to an elderly person who doesn’t really need anything? Or, actually, for the perfect item for anyone to give to anyone? How about an orange pomander? Basically an orange pomander is an orange with whole cloves pushed into it. It is used as an air freshener because it smells really, really, really good. 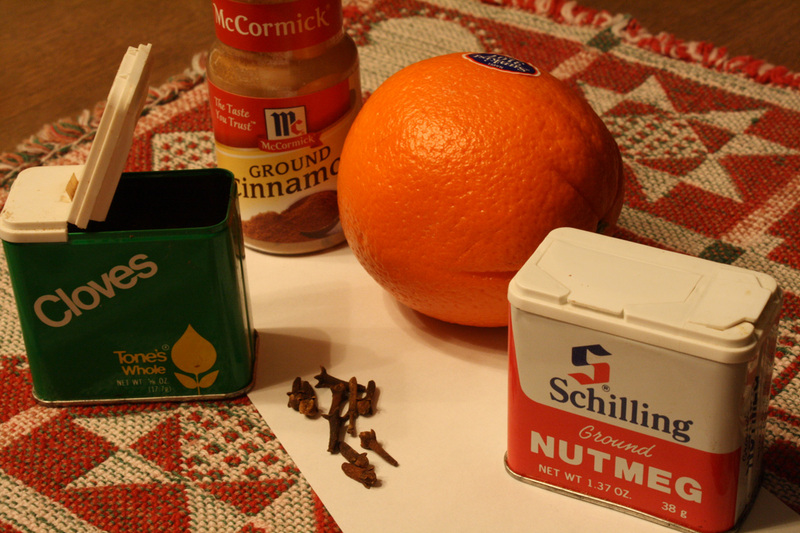 If you google “orange pomander” you’ll find many sets of directions for making one. Some directions call for a preservative called orris or sandalwood oil. Others use just an orange, whole cloves, nutmeg and cinnamon…and a ribbon. I remember making a pomander for my grandmother when I was little. (I’m almost positive I didn’t use orris or sandalwood oil.) I was so proud to give it to her because I made it all by myself (and because it smelled so good). Click here for a less-than-3-minute video of a young girl demonstrating how to make an orange pomander. If you do google, you’ll find that some directions are for a “quick” making of a pomander that could be given right away. Some versions are for a pomander that isn’t given until after three or four weeks of drying. Either way, it is a gift from the heart, inexpensive, and smells so refreshing. This entry was posted on December 20, 2009 at 6:27 pm and is filed under Recipe. You can follow any responses to this entry through the RSS 2.0 feed. You can skip to the end and leave a response. Pinging is currently not allowed. I can almost smell the pomander. I remember making them in younger years. I love the snow flakes on the blog! The snow flakes add such a nice touch. I, too, remember making the pomanders. Maybe these little snowflakes were the start of the blizzard that didn’t end….making this Christmas one of the most unusual in a long time.